James Clement Smith, was the 6th of 7 children born to Hinton Smith and his wife Mary. Hinton was a needle maker by trade and the family were shown on the 1891 census as living at Attwood House in the village of Ashwood Bank in Worcestershire. James had three half siblings and 4 siblings. His father remarried after the death of his first wife. Having studied at Bloxham, he became an electrical engineer by profession, and was shown on the 1911 census as being single and living in the Montpellier Hotel in Llandrindod Wells. He was employed by the National Telephone Company as an apprentice, before he set up working on his own. The hotel was owned by Frances Tysoe Smith, who was his maternal Aunt. 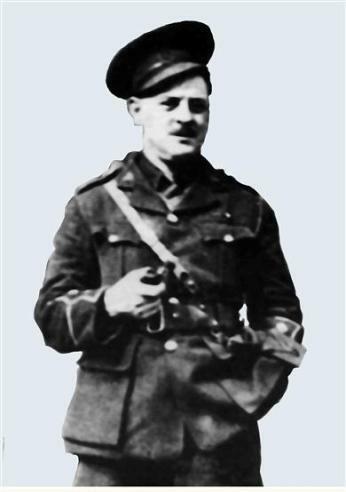 At the outbreak of War, Smith volunteered into the 16th Battalion The Middlesex Regiment (The Public Schools Battalion), and he was later commissioned as a 2nd Lt into the 4th Royal Fusiliers. 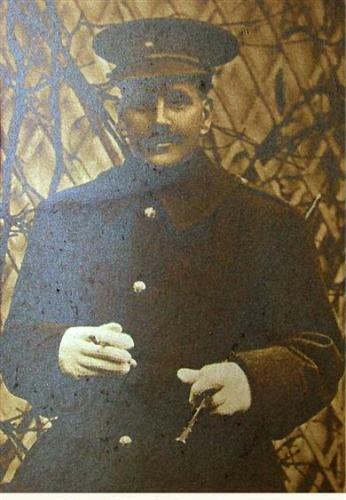 He enlisted in London on the 7th September 1914, and was recorded as being 5'8" tall and weighing 10 stone. Very little is known of his military service, however there remains a huge quantity of documentary evidence about his death in action on the 27th March 1916. There is a wonderful irony in the words of his Colonel who wrote to his parents "He was killed whilst so gallantly leading his men, in such a successful attack." In reality the attack was anything but. Smith was the bombing officer for X Company, 4th Royal Fusiliers, who on the 25th March found themselves in trenches near St Eloi. This area had been heavily mined and the battlefield was a morass of water filled craters. The area was dominated by an earth bank known as The Mound, which formed part of an nasty German salient which poked into the British lines, and dominated the surrounding area. Much of the mining in the area had been done by the Germans, however, in the summer of 1915, the British dug 6 mines under the German lines, 4 finishing under the German trenches, and 2 finishing in No Mans Land.. The idea was to detonate the mines with no warning and no preliminary artillery bombardment, before sending in the infantry, to capitalise on the surprise. The 4th Royal Fusiliers attacked to the right of the Mound, the 1st Northumberland Fusiliers attacked to the left. The mines were exploded at 4.15am on the 27th March 1916, and the infantry attacked some 30 seconds later. As soon as they left the trenches, the 4th Royal Fusiliers were sprayed with machine gun fire, and less than 1 minute after the mines had detonated, intense and accurate German artillery fire began to fall amongst the men. They were utterly disorientated, being decimated by bullets and shell fire, and were completely lost in the featureless wilderness of shell holes and craters. Private S Williams of Z Lewis Gun Company reported the following: "We came to a place called the Mound of Death, or The Mound, it lies between Vooremezeele and St Eloi and is to the right of The Bluff. Lt Smith was a brave man, and led us forward without hesitation. The following morning we were making our way back to the lines, and I saw the dead body of Lt Smith lying on the German side of the crater. A few more yards and he would have made the German lines." The attack of the 27th took a terrible toll on the 4th Royal Fusiliers. 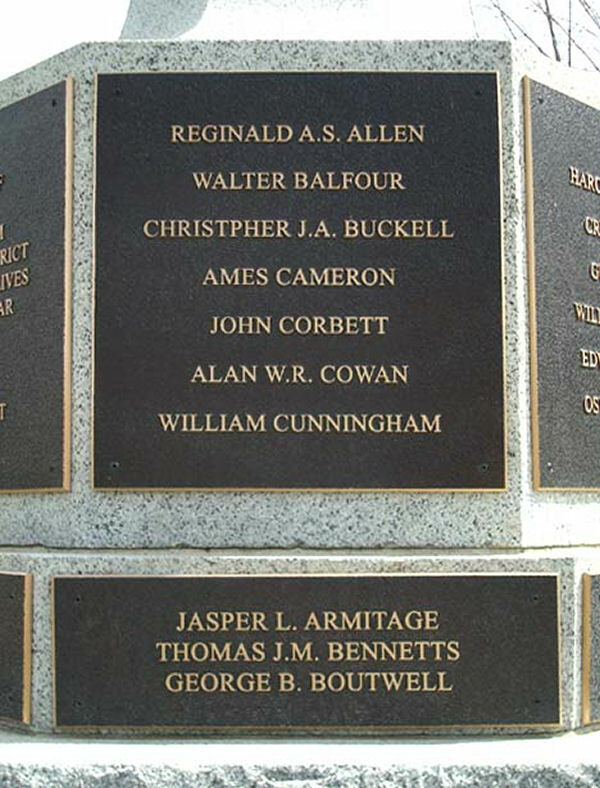 At roll call the following day, 5 officers had been killed, wounded or missing (James was shown as missing) and 255 other ranks had been killed, wounded or missing. 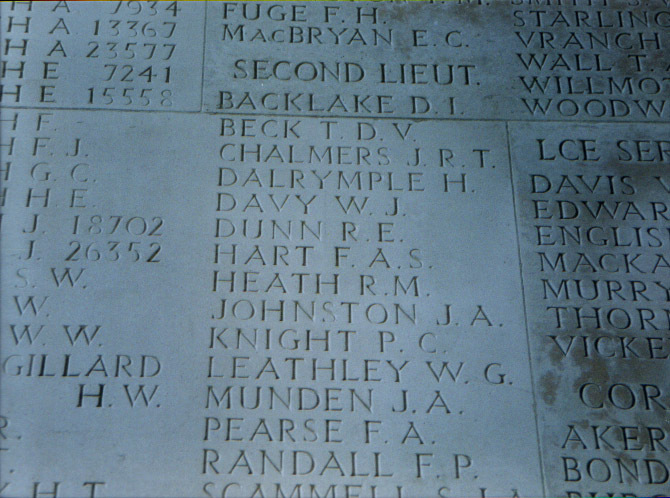 James Smith was 33 years old when he died and is commemorated on the Menin Gate Memorial in Ypres. Alex Samson has been something of an enigma throughout all of my research. I know that he enlisted into the 30th Reserve Battalion of the Royal Fusiliers, at the age of 42, on the 14th October 1914. His papers show that he was a sugar trader living in Kingston, Jamaica. He was married to Alice at the Registry Office in Croydon on the 23rd February 1902 and they had a daughter Clarissa May, who was born on the 25th July 1903 in Montreal, Canada! It appears that all of his service was done at home, and he was discharged as being medically unfit under the Kings Regulations on the 24th March 1916, and he died of either wounds or illness on the 10th April 1916. Archie Horner was a pupil at the school between 1890 and 1898. By all accounts he was something of a sportsman, excelling at both cricket and football, but it was his prowess as a heavy weight boxer for which he is best remembered. He was the Amateur Heavyweight Champion for his regiment in 1904. Even the photo of him as a young man, shows he was a stocky and well built chap! 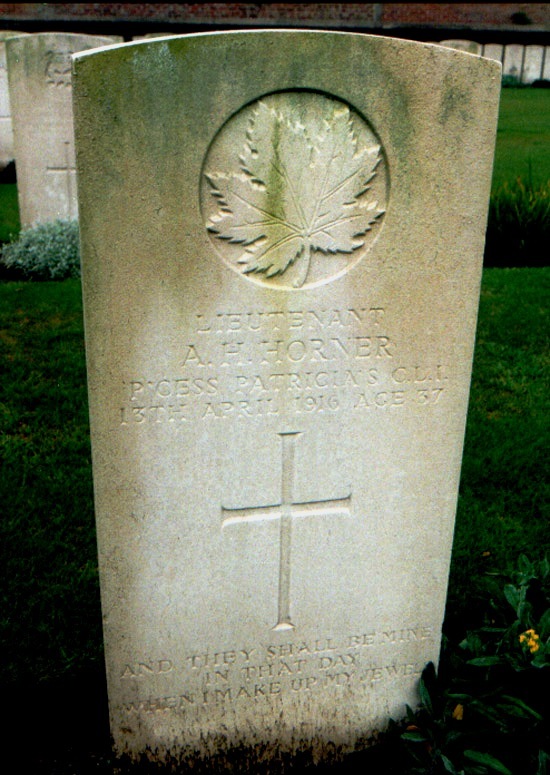 At the outbreak of War, Horner volunteered to join Princess Patricia's Canadian Light Infantry. He had previously served in the forces, having been through the South African War with Pagets Horse, serving in 1900. His attestation papers show that when he enlisted he was working as a Rancher in Canada, surely a tough life to have led! Archie did not however seem to be immune from the perils of trench warfare and spent much of 1915 invalided at home suffering from Trenchfoot. This gangrene like disease was caused by continual immersion of the feet in cold water, which led to swelling, pain and in some cases amputation. Archie seems to have been fortunate in recovering from this, only to then suffer a knee injury. He did eventually rejoin his regiment in the treches near Ypres in April 1916. The area he found himself in, was considered "hot" that is to say, a particularly dangerous place to be. It seems that on his first day back with the regiment, and whilst in command of his company, he exposed himself above the parapet, and a German sniper shot him through the head. He was 37 years old when he died and is buried in Menin Road South Cemetery in Ypres. Archie Horner holds a special place to me, as his was the first Old Bloxhamist grave I visited and photographed on a very, very wet day. Charles Howard Smith was the youngest son of Bryan Hinton Smith, and Mary Johnson. He had three siblings, Mary Grace, Bertha Maud and Frank Bryan. His mother died in 1874 and his father re-married Mary Tysoe Smith. This union produced a further 5 children one of whom was James Clement Smith (listed above). He was a pupil at the school between 1883 and 1889, and on leaving the school enlisted into the Army, serving with the Worcestershire Yeomanry throughout the South African War. 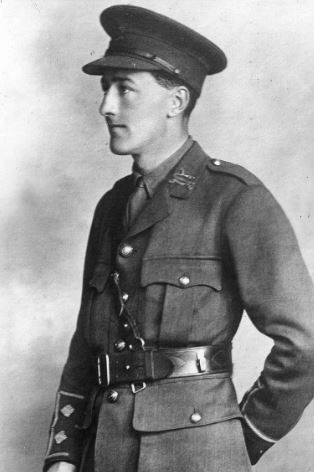 He remained in service until the outbreak of War and then served with his regiment in Gallipoli, before eventually being sent to Egypt, where he took part in the campaign against the Turks. 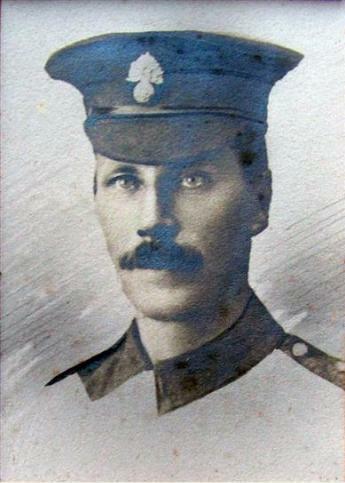 Smith was killed on or around the 23rd April 1916 during the Battle of Katia. This engagement, commemorated every year as Katia Day by the Worcestershire Hussars, saw almost the entire regiment of 450 men wiped out by a force of 5000 Turks who attacked in the area of the Suez Canal. Hopelessly outnumbered, the men of the Worcestershires put up a fierce resistance but were eventually overwhelmed and ordered to surrender by their commanding officer. Amongst those killed was Charles Howard Smith, aged 42. In his will he left his estate to his cousin James Tarleton. The Astwood Bank Cricket Club which is still in existance, was orginally based on land owned by the Smith Needleworks. The Battalion war diary for the date of his death is sadly almost illegible due to the poor hand writing of the person completing it. We do know that the Battalion was in trenches near Fresnicourt and the diary mentions no actions of note. It does mention shelling and a number of German trench raids so it is conceivable that Herbert was wounded during this time and died of his wounds on the 17th May. Harold Long was born in Edmonton Middlesex in 1896, only child of Henry and Emmeline Long. Henry was an auctioneer by trade. Harold was christened in the parish church at Winchmore Hill, Middlesex on the 8h February 1896. The 1901 census shows Harold living with his mother in a shared house at 94 Inderwick Road, Hornsey at the home of Albert Mager and his wife Marie. Emmeline is listed as "wife" however there is no mention of Henry Long, so can only guess that he had either died, or he and Emmeline had seperated. Harold attended the school between 1910 and 1913 and is described as being "a thoroughly good fellow in every way. His seriousness was probably his chief fault, if that can be described as a fault. It is perhaps worth recording that he was the first of our many servers at the alter to perfom that office in khaki." Long joined the Army, we believe in late 1914 and was posted to join the 7th Battalion The London Regiment, where he quickly attained the rank of Corporal. He arrived in France on the 18th March 1915 and served with his regiment in the Arras region. This area was the scene of the some of the worst fighting of 1915, with the disasterous campaigns at Loos and Neuve Chappelle. In September 1915, Harold suffered a gun shot wound to the head and returned to England, eventually rejoining his regiment in either January or February 1916. He had been gazzetted as a 2nd Lt on the 22nd October 1915, being promoted from the rank of Sergeant. In May 1916, the 7th Londons found themselves in the Arras sector facing Vimy Ridge, an area that had been taken over from the French in March 1916, as the French needed reinforcements in the East for the actions around Verdun. The Londons found poorly constructed trenches and the ground littered with thousands of decaying and poorly buried bodies. The French in this sector had a "quiet" relationship with the Germans and adopted a live and let live policy. The British abandoned this and spent much time harassing the Germans with artillery and morter fire, and by means of trench raids. In May 1916, the Germans noticed an enormous build up of British troops in the area (in preparation for the forthcoming offensive on the Somme) and decided to take matters into their own hands. On the morning of the 21st May, the 7th Londons were in trenches between Givenchy en Gohelle and Neuville St Vaast when the Germans began the heaviest artillery bombardment of the war to date. In 4 1/2 hours, over 70,000 shells fell on a front of only 1800 yards, as well as on communication and reserve trenches. Harold had the uneviable task of commanding a platoon of 20 men in an isolated redoubt some way in front of the British front line. This fortified point, came under special attention from the German artillery and the Battalion war diary reports "A detatched post of one officer and twenty men on the left front was completely wiped out, with the exception of 4 men who managed to make it back to the front line." The war diary contains a number of hand written reports from officers who were present at the time, and the graphic reports of the relentless German artillery fire make sobering reading. Of an entire Brigade, only two companies remained alive when German infantry attacked at 8.30pm on the evening of the 21st May. There are reports of entire companies trapped in the trenches being wiped out by shell fire, as they were trapped in the narrow communication and support trenches. One cannot begin to imagine the carnage and hell that these men must have experienced. The shelling was relentless for the rest of the day, with wounded men being fired on with tear gas and heavy shrapnel fired from trench mortars. 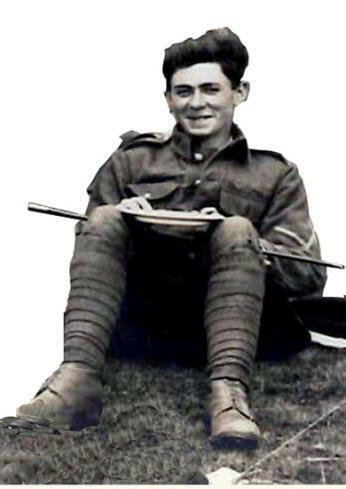 The Battalion was finally relieved at 9pm by the Royal Berkshire regiment but the dead and wounded ran into the hundreds, among which was Harold Long. "Admiral Hipper was in action again. At 4.10, being then eleven miles away abaft the beam of the Lion, he inclined inwards a couple of points, and as Admiral Beatty simultaneously altered still more to port to press his van, he was able at 4.17 to re-open fire at extreme range. The Lion had not yet been able entirely to master the fire that was smothering her. To the Germans she must have been invisible, for the Derfflinger, mistaking the Princess Royal for the flagship, began firing on the next astern, which the Seydlitz was also engaging. Thus the Queen Mary, at from 15,800 to 14,500 yards, became the target of both these ships. For about five minutes she stood it gallantly. She was fighting splendidly. The Germans say full salvoes were coming from her with fabulous rapidity. Twice already she had been straddled by the Derfflinger, when at 4.26 a plunging salvo crashed upon her deck forward. In a moment there was a dazzling flash of red flame where the salvo fell, and then a much heavier explosion rent her amidships. Her bows plunged down, and as the Tiger and New Zealand raced by her to port and starboard, her propellers were still slowly revolving high in the air. In another moment, as her two consorts were smothered in a shower of black debris, there was nothing of her left but a dark pillar of smoke rising stemlike till it spread hundreds of feet high in the likeness of a vast palm tree. Two such successes were beyond anything the Germans had reason to expect." In all 57 officers and 1209 men died when the Queen Mary was sunk. There were only 10 survivors. 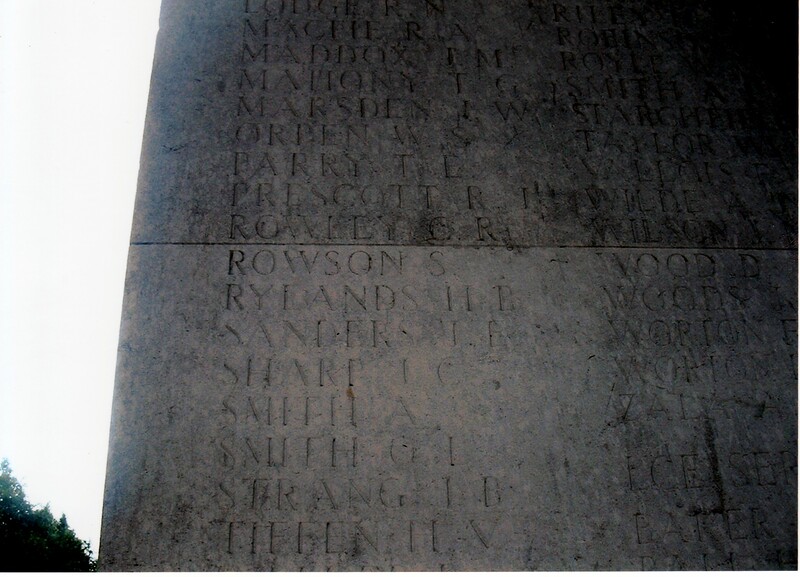 Robertsons body was lost at sea and he is commemorated on the Portsmouth Naval Memorial. 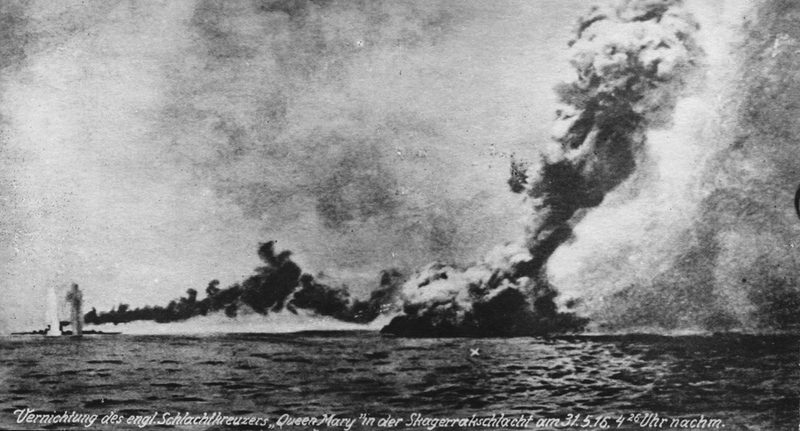 HMS Queen Mary sinking at the Battle of Jutland. George Shorland was the only son of Dr Edward Peter Shorland and his wife Caroline. 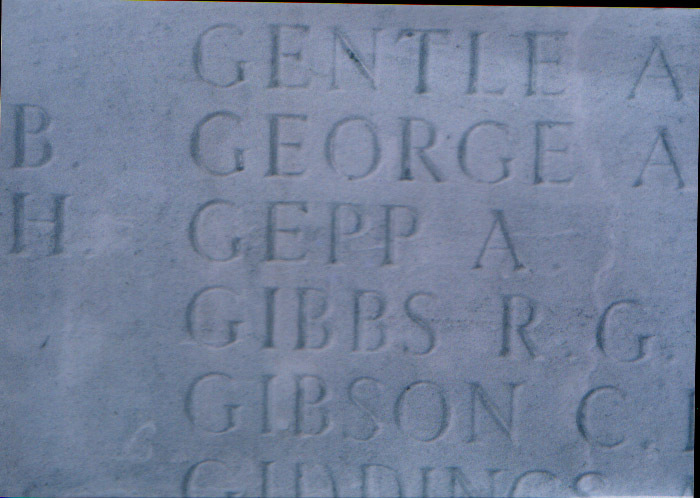 His father was a surgeon, and George was born in Westbury, Wiltshire in 1877. He had one older sister Gertrude. He attended Bloxham between 1887-1890 and was also at some point a pupil at Lancing College, Sussex. He studied Medicine at Kings College, Cambridge until 1901 and then went on to study surgery at Guys Hospital, qualifying ChB in 1906. He then went into practice in Mill Hill, London and served as the medical officer for the Railway Services Benevolent Institute. He was also the honorary Medical Officer to the Railway Clearing House, Euston. 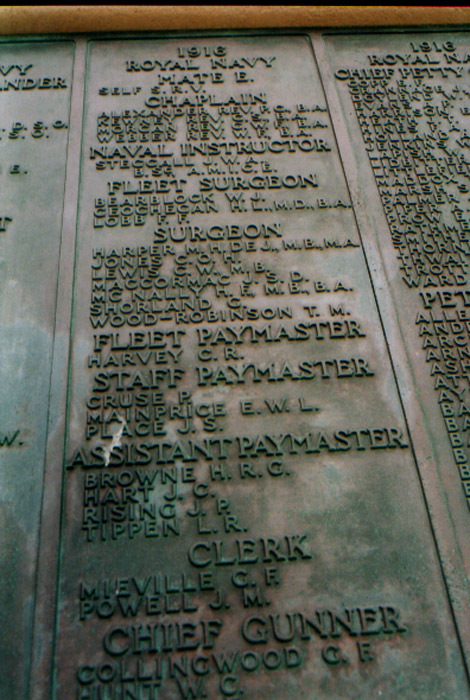 It is not known how he came to join the Navy but at the Battle of Jutland he was one of two surgeons on board the HMS Invincible. At 5.34 pm on the afternoon of the 31st May 1916, Invincible went into action and was soon under enemy attack. She avoided a number of torpedo attacks and at 6.15pm ewas engaged by the German Battle Cruiser Derfflinger, from a range of about 8000 yards. She was hit by a salvo of shell fire and fires were seen on board. Shortly after, further naval shells were fired, and massive explosion blew the ship in two. It is believed that a heavy shell hit the main magazine. Both ends of the ship were vertical out the water and the vessel sank in less than 20 seconds. Only 6 men from a ships company of 1031 survived the sinking. 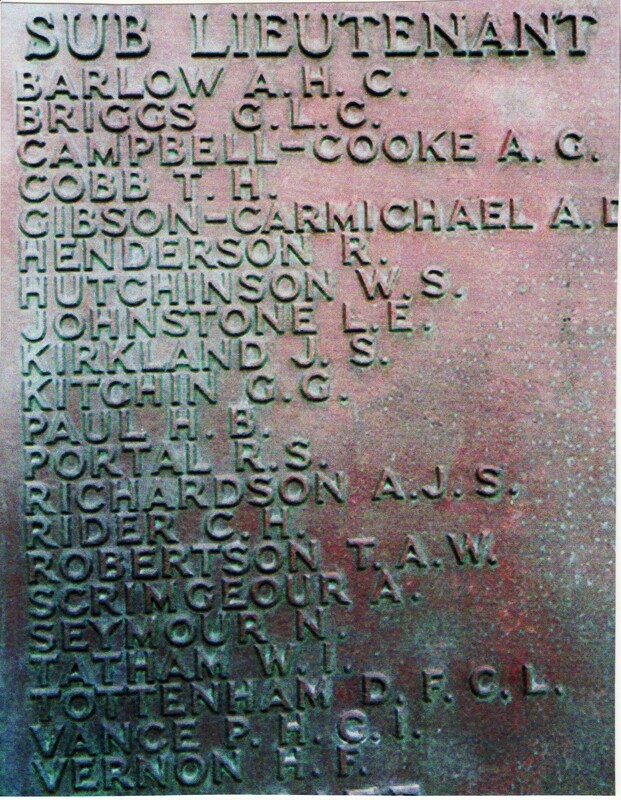 Shorland is commemorated on the Lancing Memorial, the Mill Hill Memorial, the Harpenden Memorial and the Memorial at Guys Hospital. 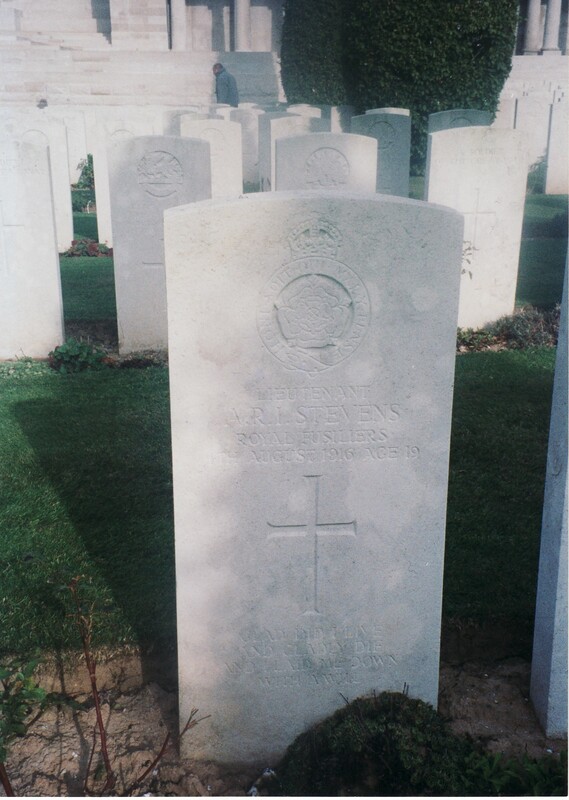 The highest ranking Old Bloxhamist to be killed in the Great War, Wilfred Ellershaw was a career soldier, who was a pupil at the school between 1884 and 1886. Ellershaw was the eldest son of the Reverend John Ellershaw, the rector of Chew Stoke in Somerset and his Canadian wife Elizabeth. Wilfred was born around 1872, and had three younger sisters, Gertrude, Hilda and Edith. By the time of the 1891 census, Ellershaw was shown as residing as an Officer Cadet at the Royal Military Academy Woolwich. In 1899 he married Katherine Ingles the daughter of Rear Admiral Sir John Ingles, and was shown on the 1901 census as being a Captain in Royal Garrison Artillery, once again at Woolwich. Between 1899 and 1906 he was a gunnery instructor at RMA Woolwich and the outbreak of War found him as a Major commanding 113 Battery of the Royal Field Artillery. 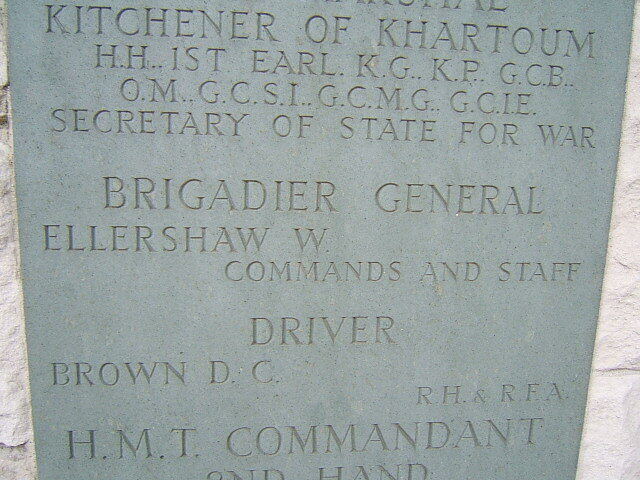 Ellershaw was a member of the MCC from 1904 and played regimental cricket to a reasonable standard. Wisden reports him as playing much regimental cricket and scoring 226 runs in the 1891 season for the Woolwich XI, at an average of 14.12. 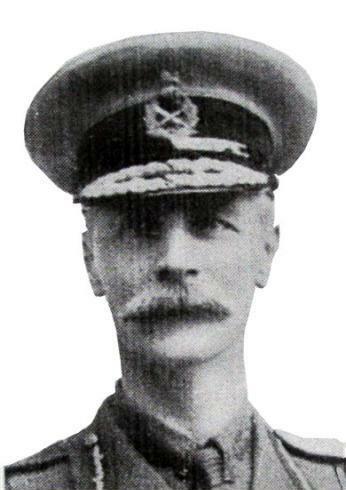 Noted for his organisational skills he quickly progressed through the ranks and having been promoted to Brigadier General in 1915, he was subsequently appointed as Aide de Camp to Lord Kitchener himself. He was engaged in much secret work, and on the evening of the 5th June 1916, he lost his life in what remains to this day a contraversial and mysterious incident. The sinking of HMS Hampshire, which cost Ellershaw and Kitchener their lives, occurred when the ship struck a mine off the Orkney Islands, during the middle of a terrible storm. The ship was on route to Russia for important meetings between Russian command and Kitchener. A summary of what happened is as follows. 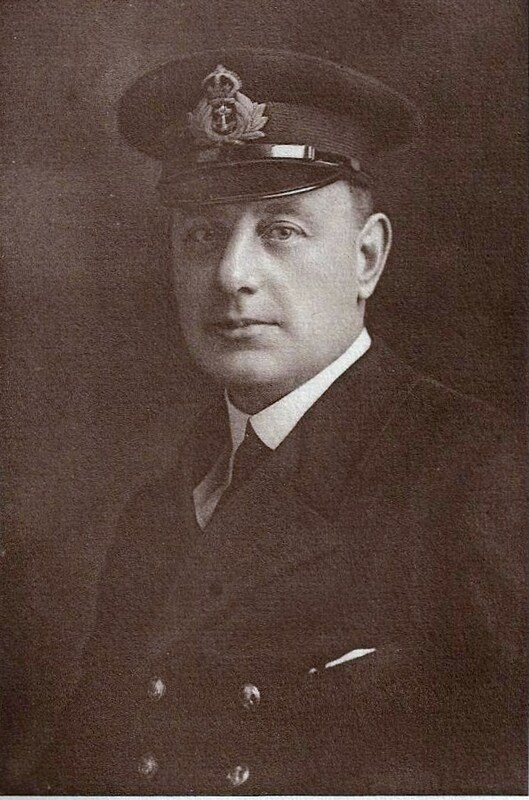 Kitchener landed in Orkney were he briefly met Admiral Jellicoe before he joined the cruiser HMS Hampshire and prepared to set sail through Scapa Flow. HMS Hampshire, with her crew of 643 men as well as Kitchener and his staff, pulled up anchors at 4:40pm on Monday 5 June, 1916. With her were the destroyers HMS Unity and Victor. As they left Scapa Flow they sailed into stormy weather. The two destroyers struggled with the force nine gale and by 6:30pm they had both been signalled to return to base. The Hampshire fought on alone. Unbeknown to the master and her crew, Scapa Flow had been visited by a German U-boat at the end of May. Undetected, U-75 laid 22 mines off the coast of Orkney. Bad weather at the beginning of June prevented the routine sweep of the area, so all the mines were out there as the Hampshire sailed on. Struggling against the wind HMS Hampshire could only maintain 13.5 knots and was roughly one and a half miles from shore. At 7:45pm an urgent telegraph message was sent from nearby Birsay Post Office to Kirkwall and Stromness. It read: "Battle cruiser seems in distress between Marwick Head and the brough of Birsay." A mile and a half out at sea the Hampshire was indeed in difficulties. An explosion had shaken the whole ship, the power had failed and she was unable to radio for assistant. She began to sink.Birsay Post Office transmitted a second message signalling that there was a "vessel down". The RNLI rushed to Stromness Naval HQ with the offer to launch a lifeboat. To their surprise their help was strenuously rejected. Further up the coast armed soldiers stood guard over the coast preventing locals from reaching the stricken ship.The Hampshire had been down for four hours by the time her lifeboats started to reach the shore. The first raft, which had 40 men in it when it left the sinking ship, picked up a further 30 from the water. By the time it reached land only six were left alive. A second craft made it to the shore. Of the 40 or 50 men on board only four had survived the journey. Those who made it were unable to haul themselves up the rocks, and most died on the shoreline. Of the 667 people who had left Orkney only 12 survived the sinking. Kitchener was not among them. He died along with his staff. The action of the authorities on the night inevitably led to intense speculation about the sinking. Questions were asked about why the Hampshire left Orkney in such a hurry, with such bad weather conditions forecast. What of the armed men stationed round the cliffs to ward off curious locals? If people were actively discouraged from helping rescue the stricken craft, there must have been a reason. Theories circulated that Kitchener had been deliberately killed or that he had not even been on the boat and that a body-double was lying dead in the sea in his place. To this day, nobody is sure sure what happened on the night the Hampshire sank. What is likely is that in the confusion of the Battle of Jutland, naval staff had failed to note that U-75 had penetrated the Orkneys. On the night itself general confusion meant officials were unsure what boat had sank, initially unsure if the boat was German or a British warship. For people living at the time the death of Kitchener was akin to the death of JF Kennedy or Princess Diana. Soldiers would later recall where they were and what they were doing when they heard that Kitchener was killed. With him dead there was a genuine fear that the war would be lost. After the war a large monument was raised in Kitchener’s memory on Marwick Head, overlooking the massive cliffs where so many lives were lost. His body was never recovered and must still lie at the bottom of the sea at Scapa Flow. Wilfred Ellershaw's body was never found and he is commemorated on the Hollybrook Memorial in Southampton. Kingsley Meredith Chatterton Fradd was born in 1897 in St Pancras, London and was the only son of Martin, a gun maker and his wife Ada. He had a younger sister Doris Mary who was born in 1900. 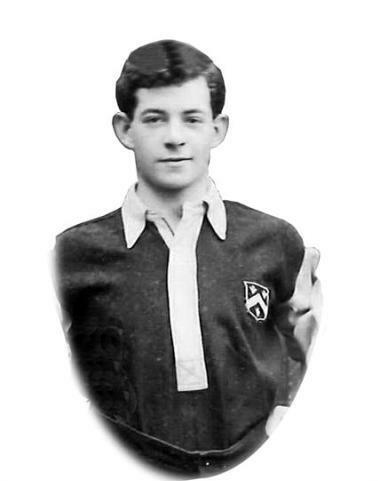 Kingsley was a pupil at the school between 1908 and 1914. Very little is known about him, and the school has pictures of him dressed as a female servant during a dramatic production. 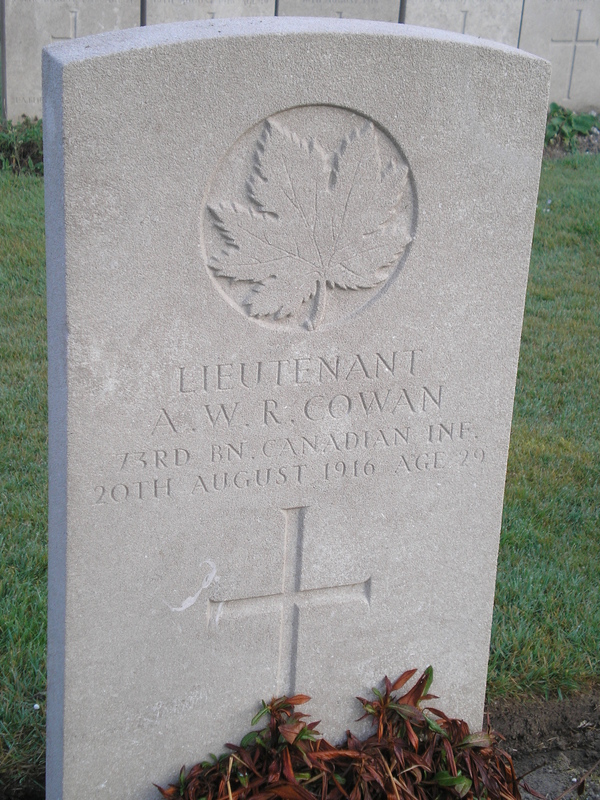 He served a Sergeant in the school CCF, and on leaving school he went to Canada where he took a position as a clerk at the First National Bank of Ontario. His name is on the war memorial at the Banks HQ in the reception area of the building. He returned from Canada in 1915 and took a commission as a 2nd Lt in the 2nd Battalion London Regiment (Royal Fusiliers). On the 1st July 1916, the opening day of the Battle of the Somme, the 2nd Londons found themselves in trenches to the south west of the small French village of Gommecourt. The attack at Gommecourt, intended as a diversionary action for the main assault further to the south, was a disaster. The London Division, of which Kingsley was part suffered over 60% casualties. The 2nd Londons were held in reserve, lying in the open until 2.30pm on the afternoon of the 1st July. They were ordered to attack a German line known as Ferret Trench which lay slightly south east of Gommecourt and within site of the formidable German strongpoint called The Quadrilateral. Three attempts were made to take Ferret Trench, each attempt was massacred by German artillery and machine gun fire. During one of these attempts, Kingsley Fradd was killed at the age of 18. He is buried in Hebuterne cemetery on the Somme. 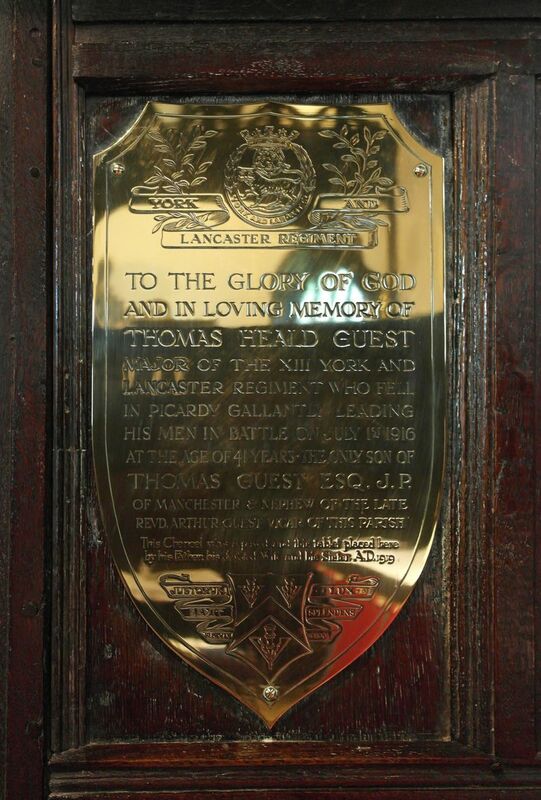 Very little is known about the life of Thomas Heald Guest. He was the only son of Thomas Guest JP of Manchester, and was a pupil at the school between 1886-1889. He served in the Army and served in the South African War, where he appears to have had a rough time, having been wounded and taken prisoner twice. He is shown as having married Mabel Ellen Fountain on the 3rd October 1905 in the parish church of Bowden in York, and his occupation was listed as being a manufacturer. By the time the 1911 census was completed, he was living in Brighton with his wife and two servants and was shown as living on private means. "He was last seen leading his compnay into a German trench and was reported to have been hit in the leg just as he reached it. I gave him the choice of leading the company or remaining in reserve, and he chose the former. Our Brigadier, who has seen many fights, remarked that he had never seen anything more splendid than the way your husband led his men through the artillery barrage and intense machine gun fire. He showed an example of bravery and devotion which has been unequalled." He was 41 years old when he died and is commemorated on the Thiepval Memorial to the Missing in France. He is also commemorated on a magnificent plaque in the church at Lower Peover in Cheshire, which also bears the school crest. Despite extensive efforts I have been unable to find any information about William Potter, who was a pupil at the school between 1908-1912. He served as a Lance Corporal with the 3rd Battalion the London Rifle Brigade and was killed by a German sniper on the 1st July 1916 near Guillemont. He was 20 years old when he died and is commemorated on the Thiepval Memorial to the Missing. Edward Peecock was the second son of Edward Beck Peecock and his wife Elizabeth, who lived at 11, Westbury Road in Brentwood, Essex. His father was a Commercial Traveller, and he had an older brother Percival. The census records show no record of either brother in 1911, but in 1901, Edward was shown as being 7 years old. He was a pupil at the school between 1908-1911, and appears to have enlisted as soon as War was declared, as Private 2482 in the 28th London Regiment (Artists Rifles). He landed in France on the 17th January 1915 and is shown as being commissioned as a 2nd Lt on the 6th November 1915 into the 9th Battalion Royal Fusiliers. In July 1916 the Battalion was heavily involved in the fighting on the Somme, and on the evening of the 7th July, the 9th Battalion were involved in an attack on Ovillers. The Battalion official history recounts the massacre that took place, with every officer of the 8th Battalion RF and the majority of officers of the 9th Battalion being reported as either killed, wounded or missing. Of the two Battalions, only 180 men remained alive at the end of the fighting on the 7th July. 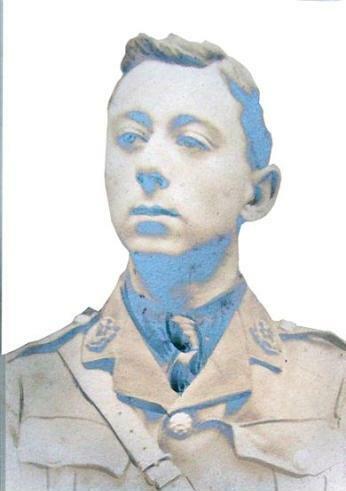 Amongst the dead was Edward Peecock, killed by machine gun fire coming from Prussian positions to the North of Ovillers. A letter to the school from a fellow officer and Old Bloxhamist (through deduction this was clearly A R I Stevens) stated "He was leading his men in a most gallant manner when he was shot down by machine gun fire, mortally wounded. His men were very fond of him and he was very popular amongst the officers. As his closest friend out here, I would ask you to remember him at the altar." This was duly done on the first Saturday of term in late 1916, and repeated the following week in the presence of his mother. He was 22 years old when he died and is commemorated on the Thiepval Memorial to the Missing. Basil Benjamin Burgoyne Brooks was the son of Alderman Edward J Brooks JP, who had been the Mayor of Oxford and resided at Athlestone Lodge is Summerstown, with his sister Gwen. 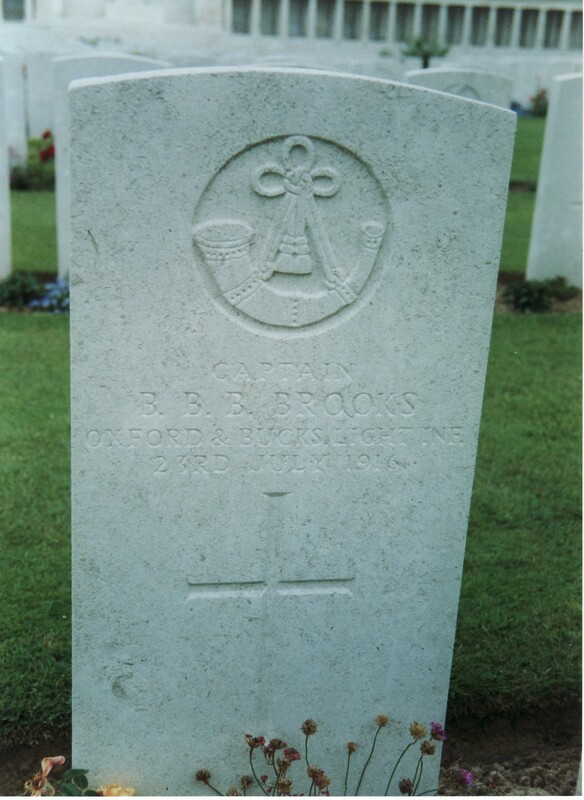 Brooks was a pupil at the school from 1906-1912, and in September 1914 was commissioned as a Second Lieutenant into the 4th Oxford and Bucks Light Infantry. At some point around this time, Basil met and fell in love with a Belgian lady who was studying in Oxford, by the name of Germain Deru. They married when Basil was home on leave from the Army in May or June 1916. On the night of the 23rd July 1916, the 1/4 OBLI were in trenches near the French city of Albert on the Somme. Having been through the sheer hell of the Somme battle, orders were received for a Brigade wide attack against the German lines near Beaumont Hamel. Basil's company, D, was to attack on the left hand side of the main group, their objective being to capture a number of German trenches. The attack began at 12.30am, earlier than planned owing the supporting Australian division being involved in heavy fighting to the south of the 1/4 OBLI. From the moment the attack started, things started to go wrong, and D Company advanced less than 30 metres from their start off point when they were pinned down by heavy bomb and machine gun fire from the waiting Germans. Casualties were extremely heavy, and it was only through the selfless bravery of a Sgt Clarke that attack did not completely falter. Worse was to come however, D Company managed to extricate themselves from this position, and with officers and NCO's in short supply, communications broke down and the remnants of D Company advanced beyond where they should have been. They were caught in heavy machine gun fire from their right, and were then caught in British artillery fire which fell amongst them. At 1.30am an urgent call for help was made by the 1/4 OBLI, and eventually help, in the shape of men from the Royal Berkshire Regiment arrived. The fighting grew in intensity and men resorted to fighting with bayonets and bombs for the next hour. During the course of the day there were repeated counter attacks and bombing runs from the Germans, before the attack petered out. Some objectives were taken and many German casualties were inflicted when a soldier from the Berkshires managed to get into the German trench with a machine gun and fire down the length of the trench. During this chaos and confusion, Basil Brooks was killed, seemingly shot through the head on the parapet of a German trench. His body lay where it fell for several days before it was eventually recovered. The 1/4 OBLI suffered heavy casualties in this attack, losing 2 officers killed, and 8 wounded and 40 OR's killed and over 160 wounded. Basil was 21 when he died and is buried in Pozieres Cemetery on the Somme. Reginald Funge Potter was the 5th son, and 6th of 8 children to Frederick William Potter and his wife Clara Louise and lived at 246 Nelthorpe Road in Enfield, North London. Frederick's occupation was listed as Director of Public Company. He was baptised on the 17th January 1883 with his brother Douglas. 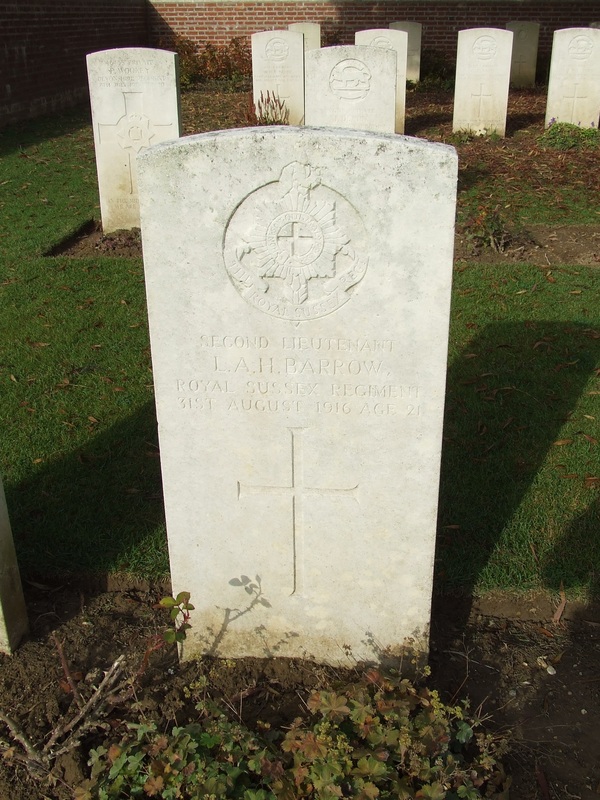 He was a pupil at the school between 1894 and 1899 and it is not known what happened to him between leaving the school and enlisting as Private 1944 in the 10th Royal Fusiliers in August 1914. He was gazetted as a 2nd Lieutenant in the 4th Battalion the North Staffordshire Regiment on the 11th May 1915 and served with the Battalion througout. It has been very difficult to peice together his service, and there is an anomoly which has been thrown up. The records that do exist state that he served in the 4th Bn. The North Staffordshire Regiment and died whilst serving on the Somme. The 4th Bn. however were based in the UK at the time of the Somme offensive, so he can only have been serving with another Battalion at the time. 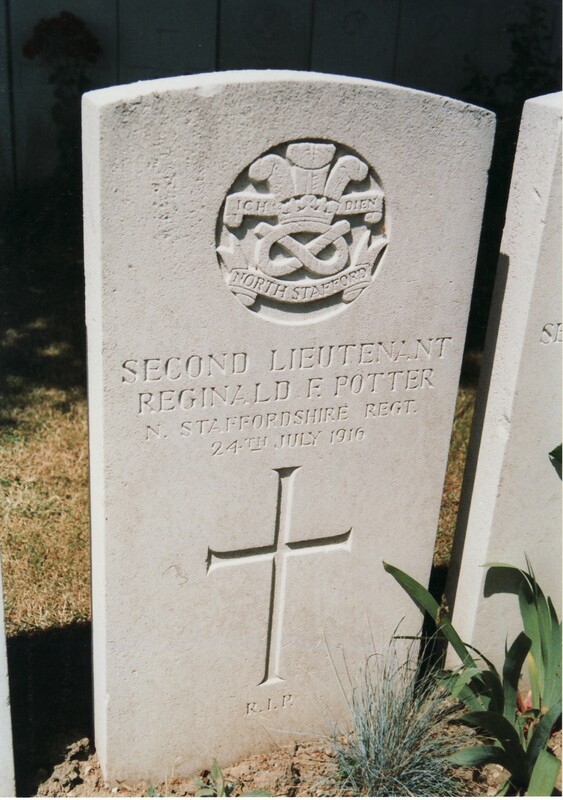 Extensive checks of the War Diaries of all North Staffordshire Regiments make no mention of Potter by name so it is impossible to ascertain where he was or what he was doing. From the Battalion diaries of all the other N Staffs Regiments, they saw action on the 1st July 1916 in the heavy fighting around Gommecourt Wood, so it is distinctly possible that Reginald served here and was either wounded here, or in later fighting. 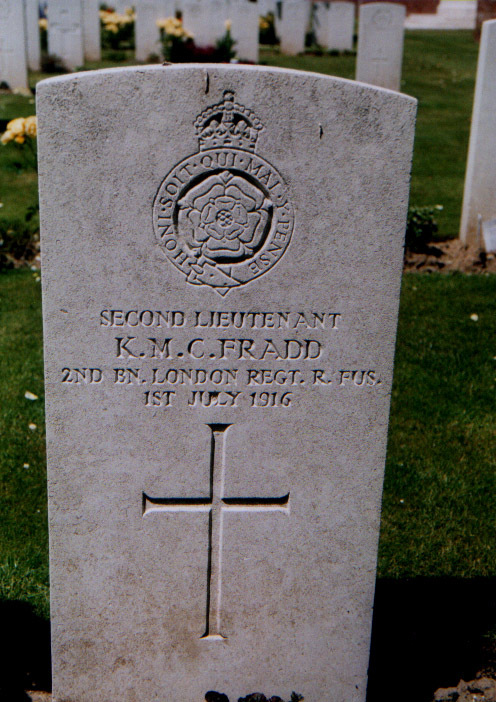 He died of wounds on the 24th July 1916, and he is buried in Corbie Communal Cemetery, France. His grave is adjacent to that of Major Billy La Touche Congreve VC, DSO, MC. Most of the 79 Bloxhamists who perished in the Great War present a straightforward, if frequently demanding and time-consuming task to a researcher, with no doubt over their identity or final resting place. In some cases, however, there is considerable confusion over names and circumstances of death. Harold Robinson is an outstanding example of this, as there has until recently been doubt over where he died and where, or whether, he was buried. The Commonwealth War Graves Commission appears to have made an error in recording that he has no known grave. 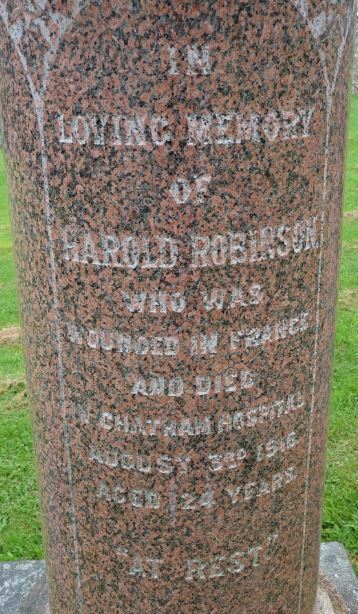 Harold Robinson was the older of two brothers of William and Lucy Robinson of Pendleton, a village a few miles from Manchester (now swallowed up by the Manchester suburb of Salford). There were also two sisters, Nora and Amy. William was a builder by trade; he was from Lincolnshire and Lucy from Yorkshire. Harold was born on 9th September 1892. 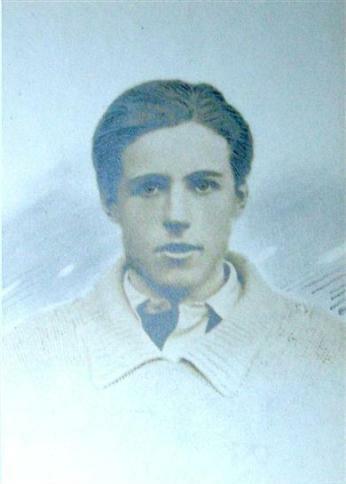 He and his brother Cecil both started at Bloxham School in September 1905; Harold made an immediate impression on the games field. The school magazine, the Bloxhamist, reported of the 1907 Sports Day that “H. 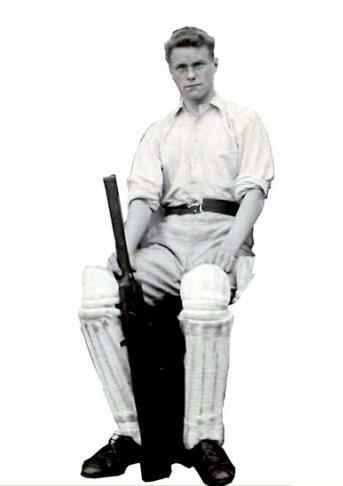 Robinson ran very well for his size.” He was a promising opening bowler, the Bloxhamist opining that “Robinson is distinctly promising, but at present is apt to bowl short and too much on the leg side; could he but cure himself of the latter fault he would be of great assistance to the team.” Harold left the school in December 1908 at the age of 16 and went out to Canada to farm, but returned to England in 1914 with the intention of farming in the old country. By this time his parents had moved to nearby Eccles. 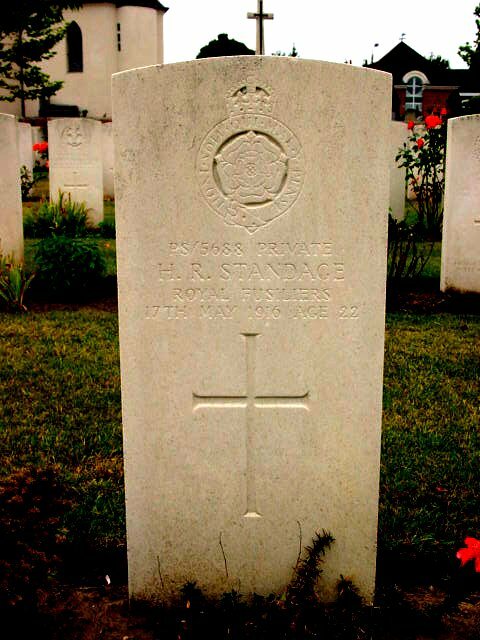 Harold joined up with his brother Cecil in Manchester as a private in the 20th Battalion Royal Fusiliers (the 3rd University and Public Schools Battalion) and after training on Salisbury Plain (close to Chitterne) he went out to France on 15th November 1915 serving in the ranks along with another Bloxham contemporary, Herbert Standage, who was to die in May 1916. 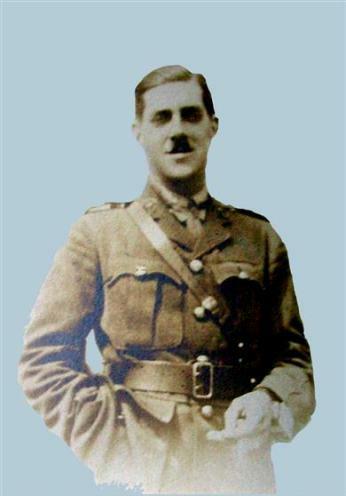 Harold took part in 33rd Division’s attack on High Wood on 20th July, the third British attempt to take that strong defensive position since 14th July. He was wounded, and died on 3rd August 1916 at Chatham. He was buried in the churchyard of St Mary, Chitterne, in Wiltshire on 5th August. An article in the Eccles Journal of 1st September 1916 reported Harold’s death and burial in Chitterne as well as the fact that his brother Cecil had been wounded in the same attack. Despite what Robert Graves wrote in “Goodbye to all That”, where he suggested that the 20th Royal Fusiliers had performed poorly at High Wood, 397 men (two thirds of the effective strength of the Battalion) had become casualties - dead, wounded or missing – by midnight on 20th July. This included every single officer as well as the two Robinson brothers. There are several mysteries about the circumstances of Harold’s death and burial. First, how did he die in Chatham if he was wounded at the Somme? Second, why was he buried in Chitterne in Wiltshire when his family were from Greater Manchester? 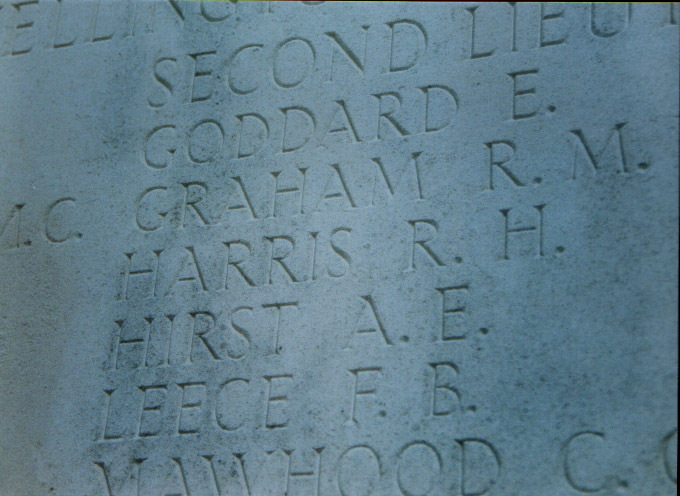 Third, why is his name on the Thiepval Memorial to the Missing if he has a known grave? The first two questions can be asked thanks to the contribution of his great niece to an online Great War forum in December 2010. She reported after speaking to her aunt that Harold was shot in the arm at High Wood and no medical pack was applied at the time. He was shipped back to hospital in Kent where he died of tetanus, or lockjaw as his family termed it. As for the connection with Wiltshire, his parents had bought Harold a property in Chitterne, Clump Farm, a mixed arable and livestock farm with pigs and milking cows, for him to make a go of farming on his return from Canada, and we must assume that it was his parents’ wish to have him buried in Chitterne. The family believes that at least one of the children was born in Chitterne, and William was certainly one of the biggest landowners in the village, albeit an absentee one. There can be no doubt over the fact that we have the correct Harold Robinson, as his great niece has confirmed that the photograph on this website is the same as the photograph she has of her great uncle. The third question remains a mystery but is probably down to a bureaucratic oversight, unsurprising and certainly not unique in a vast citizen army suffering an utterly unprecedented scale of loss – Harold’s regiment, the Royal Fusiliers, alone raised 47 battalions during the war. The sheer scale of the operation confronting the Imperial War Graves Commission and its successor, the Commonwealth War Graves Commission, is mind-boggling, and it cannot be surprising that a few errors were made. For an insight into the extraordinary work they did, see David Crane’s excellent book “Empires of the Dead”. 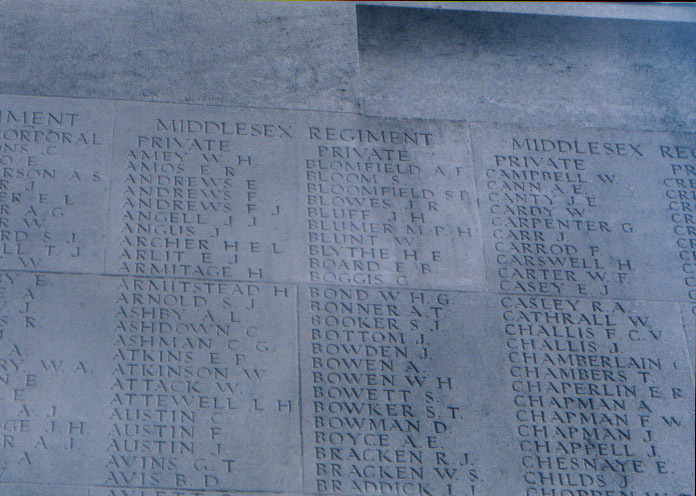 It has been suggested that the Harold Robinson on the Thiepval Memorial was not the same Harold Robinson as the one who lies buried in Chitterne, and one of the arguments employed to support this was that “our” Harold Robinson was from Manchester and so would not have joined the 20th Royal Fusiliers, a London battalion. In fact over half the casualties from High Wood on 20th July were from what is now Greater Manchester, both the city itself and suburbs like Salford. Although the Royal Fusliers was known as the City of London Regiment, the 20th battalion had strong connections with Manchester in general and its University and Grammar School in particular. The other three public schools battalions of the Royal Fusiliers had been disbanded by July 1916 in order to provide much-needed young officers for the army, and disquiet was expressed by local MPs that men of the 20th battalion were not similarly being given commissions, which might explain why the Robinson brothers and Standage all served in the ranks, unlike the majority of their Bloxham contemporaries. Harold’s brother Cecil became a cotton salesman after leaving Bloxham in July 1910. 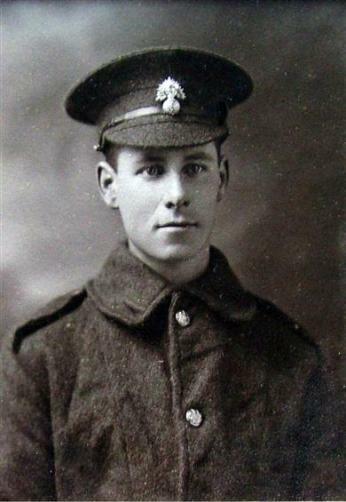 He enlisted in Manchester in the same battalion as his brother and went out to France in November 1915. He was wounded in the same attack in which his brother received his fatal wound, and recovered in hospital in Edinburgh. He returned to the front and was taken prisoner in May 1917, remaining in a German Prisoner of War camp until the armistice. After the war he became a building contractor, living in the family home in Eccles. The confusions involved in this tale (Harold’s medal card states that he died of wounds on 25th July, though he was actually still alive at this point) provide a good example of the painstaking research required to tell the stories of those who died in the Great War. 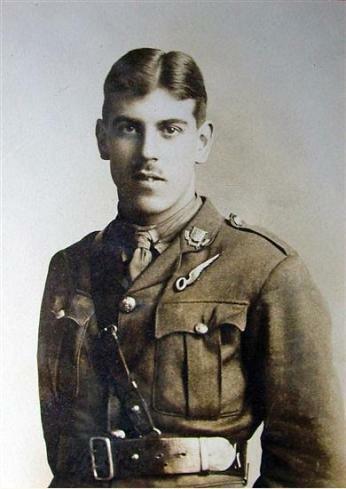 Lieutenant Arthur Reginald Ingram Stevens was a pupil at the school between 1909 and 1913, and on leaving the school he went to the University of London - during this time he served in the University OTC. At the outbreak of War, he was offered and immediately accepted a commission into the 9th Battalion the Royal Fusiliers. The regiment proceeded to France in May 1915, but owing to ill health, he was unable to join them until December 1915. During this time of illness he was working in England in reserve at Shoreham - this must have been a challenging time for a man who wanted to be in action. The 9th Royal Fusiliers were in action almost constantly throughout 1916, and eventually found himself thrown into the maelstrom of the Somme. On the night of the 4th August 1916, Arthur's company were charged with making a night attack on the heavily defended German line known to the British as Ration Trench. The adjacent aerial photograph was taken in July 1916 and shows the wilderness that the Somme battlefield had become. The attack was documented in the Battalion War Diary, and started in the early hours of the morning of the 7th August, whereby the 9th RF attacked in conjunction with the Royal West Kents. The war diary reports that between 1am and 4am all was going well, until a sudden counter attack by the Germans. 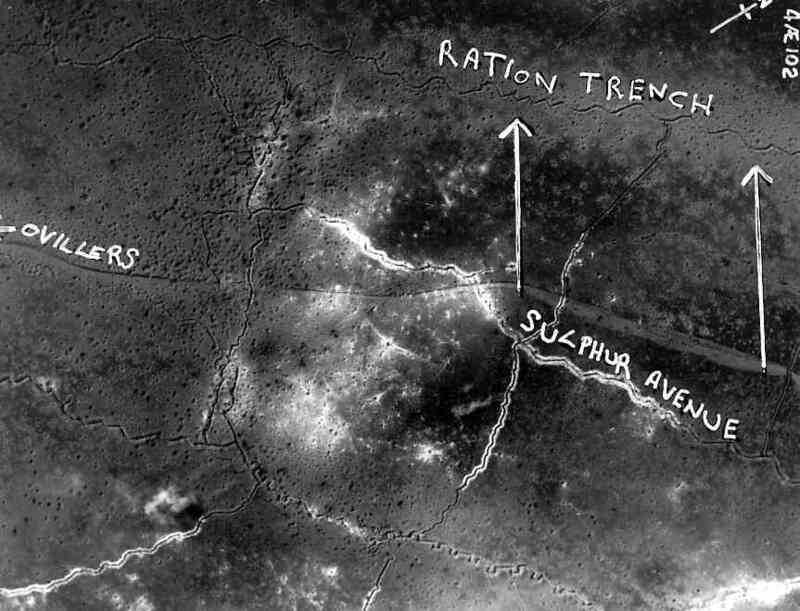 Ration Trench when they were caught in a sudden artillery bombardment. The panic of this caused them to swing eastwards and they were trapped in an area of exposed ground. Without warning they were attacked with German flamethrowers and heavy machine gun fire and suffered appalling casualties. The bombardment carried on for several hours before the regiment was finally relieved by the Royal Sussex Regiment. 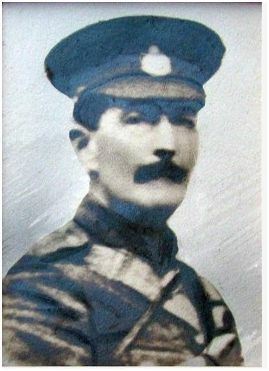 During this engagement the 9th RF suffered heavily with 5 officers killed, including Arthur Stevens, 7 officers wounded and 281 other ranks killed wounded or missing. His file contains a number of letters from his father which seem to suggest that he was underage when he died, however I have been unable to confirm this. Alan William Russell Cowan was a pupil at the school between 1901- 1905. He was born on the 5th March 1887 and was the son the of Reverend Herbert Cowan, the Vicar of Bushley, a small rural parish in Worcestershire. Cowan was shown as being resident in Wisbech, Norfolk prior to his departure to Canada where he sought his trade as a Rancher, somewhere on the vast plains of British Columbia. At some time during his stay in Canade he married Emily Harris Russell Soanes of Kelowna, and they had two children. As well as being a Rancher, Cowan was also part of the Canadian Militia, having served in the 30th British Columbian Horse. He enlisted into the 103rd Canadian Infantry on the 17th July 1915, and was eventually commissioned as a Lieutenant into the 13th Bt.Canadian Infantry - Canadian Black Watch on the 10th March 1916. It seems possible that the delay in his progressing overseas was that he was one of the "unwanted" - that is to say an officer from a colonial force deemed by the British as not fit to lead men in battle. On the 14th August he set sail for Europe and arrived on the 26th. He spent some days on the Coast near Calais and was the finally transferred to his regiment who were at the time in trenches near Ypres, arriving on the 13th September 1916. The Battalion had been in action almost constantly for the preceding 8 weeks in heavy fighting to the South West of Ypres,in the sector dominated by Hill 62 at Sanctuary Wood. This strategically important mound was the scene of some terrible fighting between Canadian and German forces. During the fighting in this part of Belgium, the Canadians suffered 8430 casualties. On the morning of the 20th August, one week after arriving in theatre, Cowan was hit by shell fire in the area around Mount Sorrel. He was horrifically injured, his left leg being partially amputated with the left femur protruding, as well as serious arm injuries. He was in an Ambulance on route to Casualty Clearing station No 10 when he died. He was buried at the time in temporary grave before being finally interned in the massive cemetery at Lijssenthoek. The cemetery contains 9901 graves. 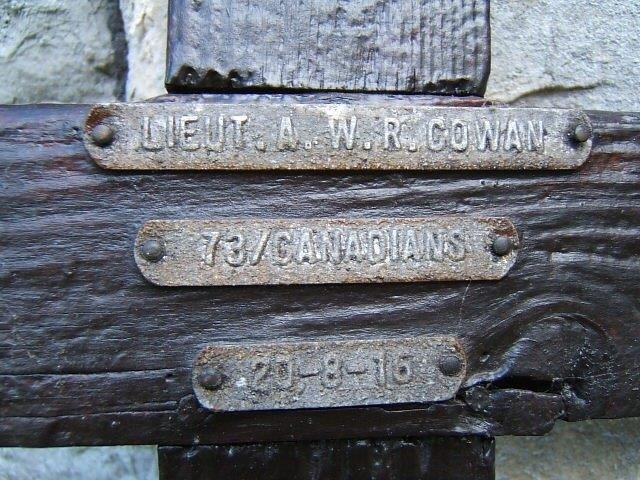 His original wooden cross which marked his battlefield grave can be found on the wall of St Peters, Bushley and his name is also on a memorial at Salmon Cove, British Columbia. He was 29 when he died. Walter Rowland Heath was the 9th and youngest child of Richard and Jane Heath and came from Yoke Farm in Rochester. His father was a butcher by trade. He was a Master at the School between 1902-1904 having studied Classics at Hatfield Hall, University of Durham, where he was a member of the OTC. Heath was an outstanding sportsman, captaing Durham University RFC, he was President of the Rowing Club, and was also a fine athlete and swimmer. During his time at Bloxham he continued his athletic pursuits and was well known for spending much time in the Gymnasium. On leaving Bloxham he travelled to Cairo where he took up a position with the Egyptian Department of Education. He remained in this post until the second year of the War when he returned to the UK and took a commission into the Oxford and Buckinghamshire Light Infantry. He spent some time in a staff role as an inspector of Physical Drill and Bayonet routine. With the massive casualties that the Somme campaign had inflicted he was put into the line at a time when officers were desperately required. On the afternoon of the 23rd September 1916, the 1/1st OBLI found themselves in trenches near Thiepval when they received the order to attack German lines near the formidable strongpoing of the Tare and Usna lines. The Battalion relieved the 6th Battalion the Gloucestershire Regiment that morning and were ordered to prepare for an attack on the German lines opposite. Walter was commanding A Squadron. The attack was scheduled for 3.05pm and between 1pm and 2.45 a heavy British artillery bombardment took place. At 3pm a heavy and intense barrage was laid down on the German lines, but this appeared to have fallen well short. The moment the OBLI left their trenches, they were subjected to accurate and prolonged machine gun and mortar fire from the untouched German lines. To make matters worse, accurate German shell fire began to land amongst the men. 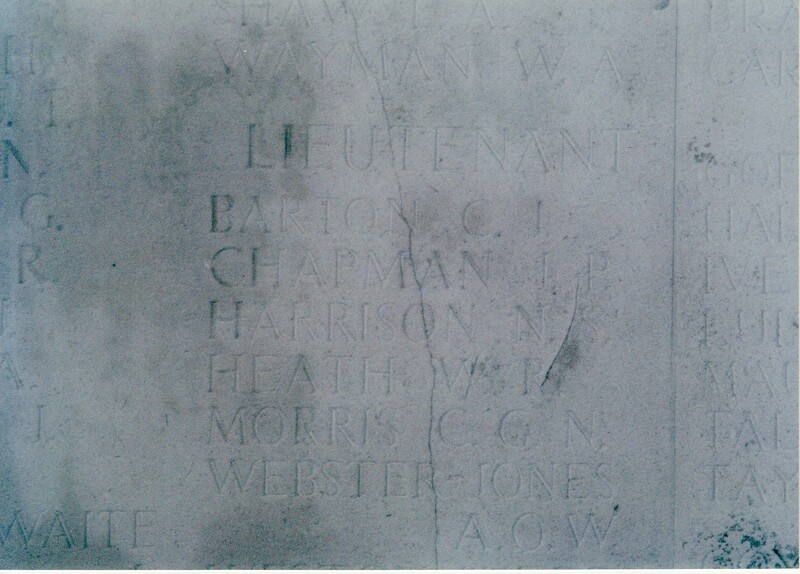 C Company, commanded by 2nd Lt.Bates pushed forwards, but Bates was killed almost instantly. 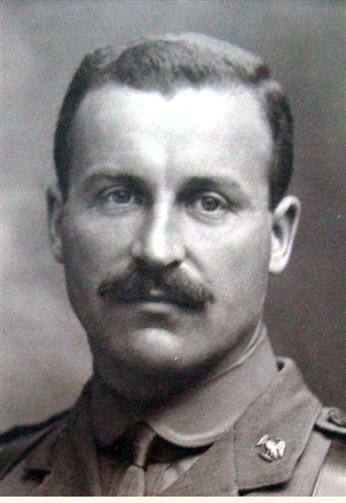 Walter Heath tried to rally his men and pushed forwards only to be cut down in a hail of machine gun fire. The remnants of A Company had to lie in no mans land until darkness fell, under almost constant shell fire. Heath's medals were sold by Dix Noonan and Webb in London, in December 2011. Laurence Arthur Howard Barrow was the only son the Reverend Alfred Barrow and his wife Emily, and was born in 1896. On the 1901 census he was shown as living at the Vicarage, East Street in Billingshurst. Laurence was a pupil at the school between 1907-1912 and on leaving he studied Theology at St Edmunds Hall in Oxford, his intention being to enter the Priesthood. At the outbreak of War he enlisted as a Private in the 5th Battalion the Royal Sussex Regiment, and was commissioned as a 2nd Lieutenant into the 11th Battalion in January 1915. There now comes an element of confusion over what Barrow was doing, indeed even what Battalion he was actually in at the time of his death. From looking at all the Battalion War Diaries, and his place of burial Englebelmer, it seems likely that he was actually with the 12th Battalion who were in Englebelmer at this time. There is also some confusion over what date he died, the Commonwealth War Graves records his death as the 31st August, there are other sources which show his death as being the 1st September. Based on the location, the 12th Battalion were in trenches near Englebelmer in the north of the Somme region. The Battalion war diary, which is fairly sparse on details advises that Battalion suffered very badly on the 31st August from heavy and prolonged enemy shell fire, especially around the area of Englebelmer Wood. It seems most likely that Barrow was killed during this shelling, although he is not mentionned by name. He was 21 years old when he died. 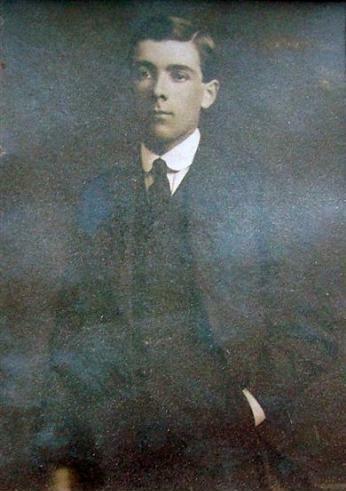 Reginald Harris was a pupil at the school between 1906-1909 and was only son of Herbert and Claire Harris, and he came from Sidmouth in Devon. On leaving the school he went to South Africa where he engaged in farming, before he became a Police officer in Rhodesia. He returned to England in 1914 and was due to take up a position in Uganda when the War broke out. He was commissioned as a 2nd Lieutenant into the 4th Battalion the West Yorkshire Regiment and served with them throughout. He was gazetted as a Lieutenant in 1916 and joined Z Coy. Trench Mortar Battery on the Somme, where he was killed by shell fire on the 3rd September 1916. His body was never found and he is commemorated on the Thiepval Memorial to the Missing. The search for a picture of Reginald Harris is, if I may be so bold to say, one of the bits of research of which I am the most proud. There were many publications which came out during and immediately after the Great War which contained portrait pictures of deceased officers. Baron de Ruvigny created a roll of honour whereby the families of soldiers could send in their obituaries of their relatives. It ran to 5 volumes and sadly the money ran out, and so no more were published. 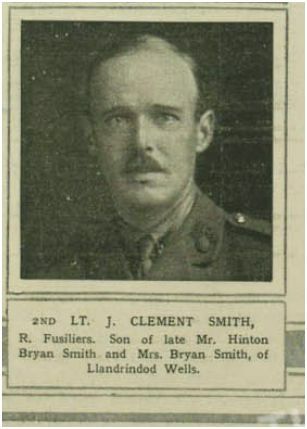 The Illustrated London News ran a feature called "Died on the field of honour" which featured portraits primarily of officers who had been killed. Finding a picture of Harris was confounded by his position in a trench mortar battery, which was attached to a Regiment. I did a search of the National Inventory of War Memorials and discovered that Harris was commemorated on the Sidmouth war memorial in Devon. I went to the National Newspaper archive in St Pancras and by searching the records I found a copy of the Western Gazette, which confirmed that Harris' family were indeed from South Devon. Through modern media I located the names and addresses of 32 families named Harris still living in Sidmouth. I duly wrote a speculative letter to each one asking if they were related to Reginald. In due course, a lady called Sally Clark emailed me, saying she had been passed on my letter by an elderly lady called Hilda Harris who was a distant relative by marriage of the Harris family. Sally suggested contacting the Vicar of Sidmouth, whic I duly did. This enquiry led me to the Sidmouth History Society. 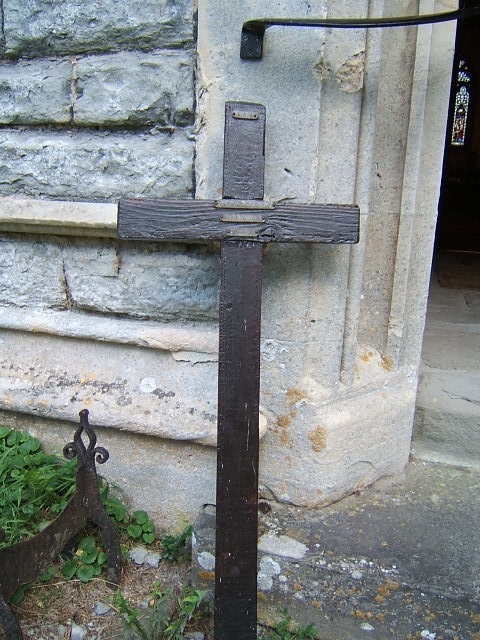 They confirmed that in 1922, the South Devon Fisherman's Benevolent Socitye mounted a campaign to erect a cross on the quayside in memory of the 66 men from Sidmouth who died in the Great War. As part of the original exhibition they included pictures of the dead, and thankfully the pictures remained to this day. Reginald was number 44 and I duly found the superb picture shown above, and I would like to thank everyone in Devon who helped. It's very hard to describe the range of emotions one feels. having spent 7 years searching for a picture of a single officer, but it is the sort of elation that makes historical research so rewarding. Frank Arthur Selwyn Hart was a pupil at the school between 1904-1911 and was the son of Wilfred Hart M.V.O and came from 41, School Road, Moseley in Birmingham. Very little is known about his military career other than he enlisted into the 16th Battalion The Middlesex Regiment (The Public Schools Rifles) as a Private before being promoted to Sergeant. On the 7th July 1916 he was commisioned as a 2nd Lieutenant into the 4th Battalion The Somerset Light Infantry, who were still on the Somme. He was the assistant bombing officer for B Company. On the afternoon of the 16th September, the Battalion had been in action and his Captain was lying wounded in a shell hole in No Mans Land. 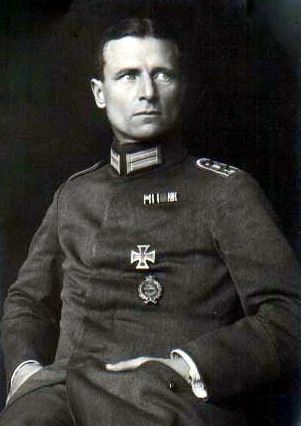 Hart left the relative safety of the trenches in an attempt to rescue his Captain and during this process a German sniper shot him dead. Oswald Nixon was the son of Colonel F W Nixon, and was born in 1895 in Pietermaritzburg, South Africa. His father was a Ships Steward in the Merchant Navy. At the 1911 census, the family were living in Chiswick, and Nixon appears also on the roll for the Bloxham census - alongside many other names who appear on this website. 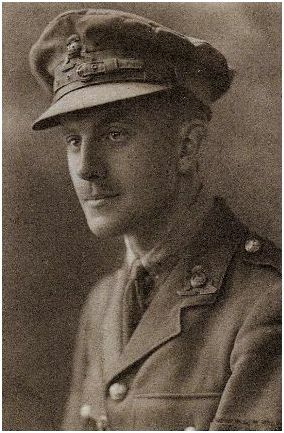 On leaving Bloxham, he progressed to Felsted, and on the outbreak of War, he enlisted into the Territorial Battalion of the Sussex Regiment, in August 1914, before being commissioned into the 10th Battalion Royal Sussex. He resigned his commission in 1915 and went to Sandhurst, and in September 1915 he was commissioned as a 2nd Lieutenant into the Essex Regiment. He then joined the Royal Flying Corps firstly as an observor between September 1915 and May 1916. 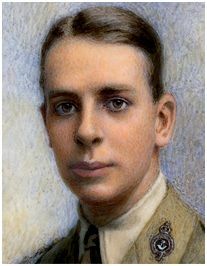 He returned to England and completed his pilots training, and was commissioned as a Lieutenant into the Royal Flying Corps. Lt Erwin Bohme who shot Nixon down. Nixon returned to France and was posted to 70 Squadron, Royal Flying Corps. On the afternoon of the 17th September 1916, he was at an airfield near Louverans, just west of Cambrai and was posted to fly Sopwith Strutter, A1193 with 2nd Lieutenant Edgar Wood as his observor. It was his first flight as a qualified pilot, and on that day he had the great misfortune to run into a Squadron of German Jasta 2 aircraft as he climbed over the German lines near Roisel. One of these aircraft, was piloted by the German flying ace Lt. Erwin Bohme. Bohme was to become on the German airforces highest aces with 33 kills to his name. Nixon did his best to escape but he was shot down and crashed in front of the German lines. 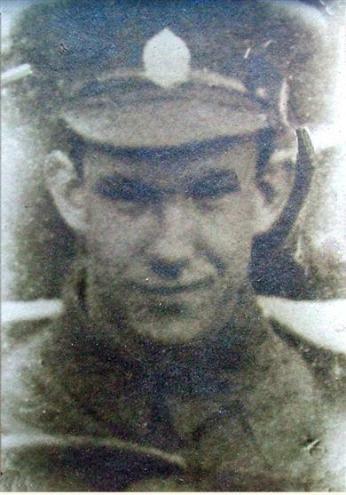 2nd Lt Wood was badly injured but survived the crash and spent the rest of the war as a POW. 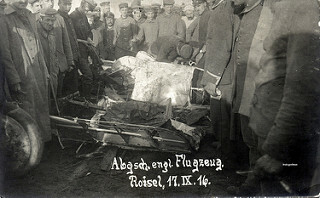 The Germans took a macabre photo of the crashed aircraft which is shown below. 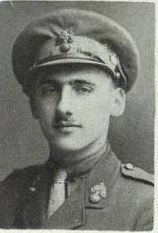 Bohme himself was killed in 1917. 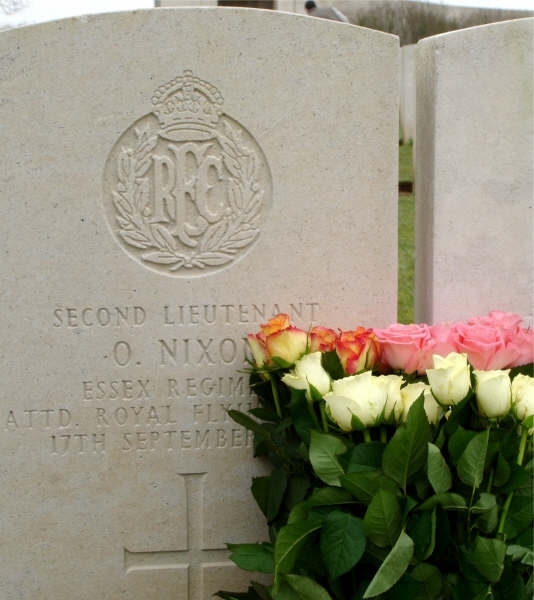 Oswald Nixon was buried in Serre Road No.2 cemetery. 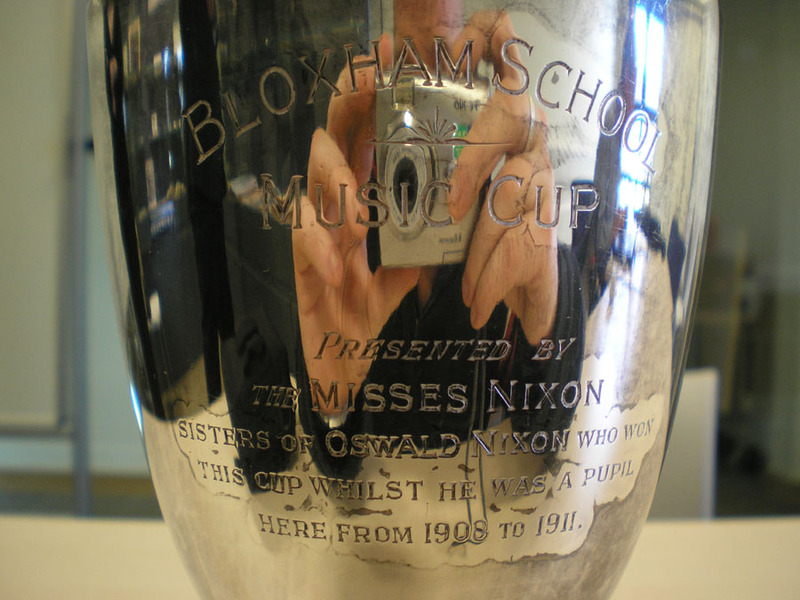 His sisters presented a silver cup to be awarded to a Musician at the school. He was 21 years old when he died. Edward Boissier Board was a pupil at the school between 1888-1894. He was the oldest son of Dr Edward Board, a Bristol surgeon, and his wife Annie. He lived at 11, Caledonia Place, Clifton. On leaving the school he entered the world of banking and on the 1911 census was shown as being a Bank Clerk, living in Hartlepool. He did work also for the National Provincial Bank in Bath and was on the staff there at the outbreak of War. He had served for many years in the Yeomanry, and also the Militia artillery. He joined the Athletes Volunteer Force in Bath, and was finally enlisted as Private 23530 of the Royal Fusiliers. He remained here and underwent a period of training in France before he was transferred to the Middlesex Regiment. The school magazine notes that his wife received a letter informing her that he had been shot at the outset of an attack "which proved highly successful though very costly in terms of officers and men". This was the Battle of Thiepval Ridge, an assault by 3 divisions. The 18th Division, which the 12th Middlesex were part of, were at the Southern end of the advance, attacking towards the formidable German strongpoint of the Schwaben Redoubt. Supported by two tanks, some gains were made but at considerable cost. 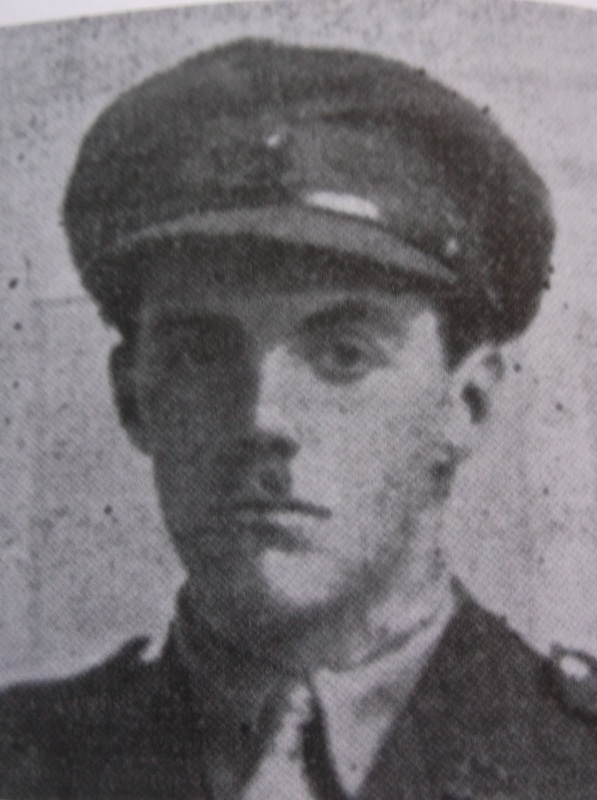 The Division lost 4000 men during the 3 day offensive, one of whom was Edward Board. His body was never found and he is commemorated on the Thiepval Memorial. Ernest Victor Molson Orford was the only son of Sydney and Ellen Orford, and lived at 54 Sleaford Road, Boston in Lincolnshire. His father was a banking cashier by trade. He was a pupil at the school for only a short period of time, between 1908-1910, before he left the school for reasons unknown. In 1912, Orford contracted TB, and was on the brink of death, but somehow made a miraculous recovery. This awful experience caused him to re-evaluate his life and he decided to devote his energies to God, and enrolled into the Priesthood. He studied Theology at the University of Leeds, before enrolling to be ordained at Theological College of the Community of the Resurrection. He was commissioned as a 2nd Lieutenant into the Essex Regiment in 1916 and immediately went into the front line on the Somme. In late October 1916, the regiment was in trenches near Trones Wood, when an attack was ordered on the German Lines. Trones Wood, one of the 5 main woods on the Somme had been the scene of especially heavy fighting between 8-14th July, was strategically important, occupying the high ground on Montauban Ridge. The attack on the 23rd October was to drive the Germans out of the last area of the wood they still controlled. The start was pushed back from 10am to 2pm owing to mist, and when the attack started, casualties were very severe owing to heavy machine gun fire. The Battalion lost every officer and NCO during this action. The war diary mentions that Orford was wounded, but there is no mention of his fate. He was never seen again after this day. His file contains a number of letters from his father, with a final letter from the War Office in March 1917 confirming that for official purposes Orford was presumed dead on or around the 23rd October 1916. He was 19 years old when he died. Thomas Thomas was a pupil at the school between 1908-1909. Very little is known about his life, and I have been unable to find him on any of the Census rolls. At the outbreak of war, he enlisted as a Private into the Oxford and Buckinghamshire Light Infantry, and was eventually commissioned as a 2nd Lieutenant in the 9th OBLI. He then transferred to the Machine Gun Corps, where he appears to have been something of a rising star, held in very high regards by senior officers and tipped for progression through the ranks. 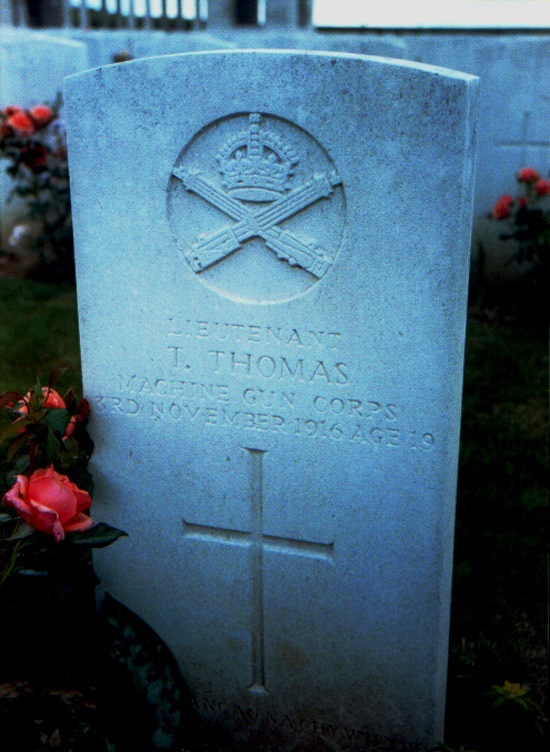 On the day of the 3rd November 1916, Thomas was in trenches near the desolate landscape of brick works, mine workings and slag heaps near Loos. His machine gun was in a sap located off Gusty Trench, and was involved in beating off a number of German attacks in company with 3 other guns. Between them they fired 16,000 rounds of ammunition. During this engagement, 19 year old Thomas was killed. He is buried in Guards Cemetery, Lesboeufs. Thanks to the Headmaster and Staff of Magdelen College School, Oxford for the picture of Thomas. Arthur Walter Gepp was the middle one of three brothers who attended Bloxham. Their father and uncle also went to Bloxham. The eldest, Robert Ernest, was at the school between 1903 and 1907. He is recorded as living in Rio de Janeiro in 1920. 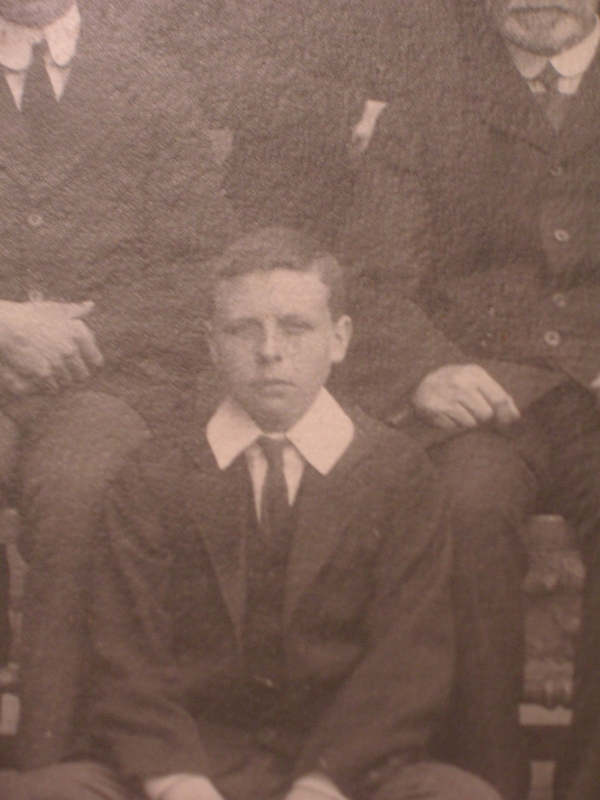 Francis George was at Bloxham between 1910 and 1913. He was wounded at Ypres at the age of 18 and disabled for life but survived to become an art manager for an advertising agency. The family lived in Chelmsford when the father, Francis William Gepp, attended the school, but by the 1900s he lived in Croydon. There appears to have been a family business, the Naumann Gepp Coffee Company, which he joined after school and from which he retired in 1925. Naumann Gepp are still going strong selling coffee in Brazil! Arthur Walter was born on October 8th 1894. 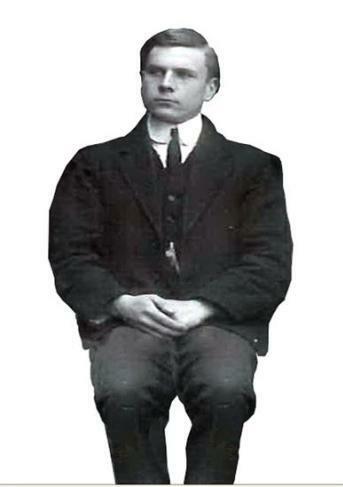 He was at Bloxham between September 1908 and December 1911. 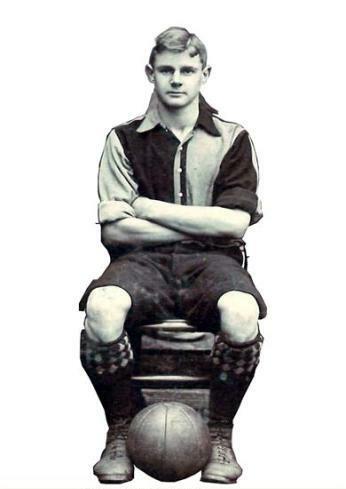 He was a Prefect in 1911 and played for the football XI in that year. He was a cadet in the OTC and passed his Cambridge Local examinations. On leaving school he was working with Norton, Megarry, another firm of coffee merchants (spelling may be wrong, Wilson’ handwriting is sometimes hard to read), until the war broke out. 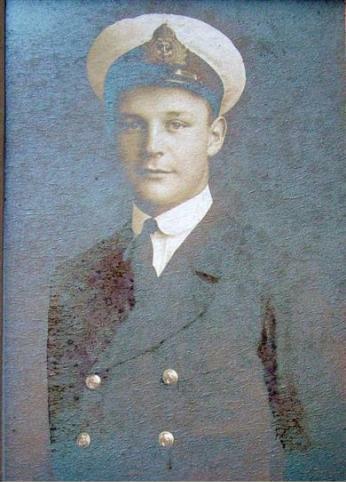 He enlisted in the 4th Queen’s, Royal West Surreys, in 1914, then the 2oth RF May 1915. BEF France November 1915. November 1916 found the 8th Battalion in the trenches near Aveluy. The Battalion war diary for the date of his death records simply that the Battalion was involved in an attack on the German trenches near Grandcourt. In company with the 10th Battalion The Royal Warwickshires, the attack set off at 6.10am and was successful in terms of taking the western edge of Grandcourt. Casualties however were heavy with 12 officers and 283 other ranks, killed, wounded or missing. The date in the school records doesn’t tally with the date on the CWGC website (18th) and nor does his regiment (Gloucestershire) though the date and regiment on his photograph do. The last Bloxhamist to die in 1916, was Harold Bertram Rylands, the younger brother of Reginald Victor Rylands, who died in 1915 at Gallipoli. 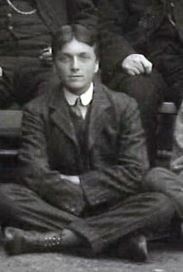 Harold was a pupil at the school between 1905-1909 after which he progressed to Lancing College in Sussex, before embarking on the study of Law. He enlisted into the Lancashire Fusiliers on the 19th December 1914 and was gazetted as a 2nd Lieutenant same. He served with the Regiment throughout, and was wounded in May 1916. In November, the Battalion found themselves near Beaumont Hamel on the Somme, and on the 23rd November, Rylands was killed during a major offensive which became known as the Battle of the Ancre. The battle officially ended on the 24th November, by which time the British Army had suffered 23,000 casualties in just 13 days. One of these was Harold Rylands and his body was never found. He is commemorated on the Thiepval Memorial and was 21 years old when he died.